Website of Luke Bratch, aka l_bratch. udprelay - A program to retransmit UDP traffic, such as broadcast traffic, on a given port to a new set of addresses and ports, while keeping the source address and port headers. Submarine cables in the Channel Islands - Detailed information about submarine cables in Jersey and Guernsey. IP addresses in the Channel Islands - IP address blocks in Jersey and Guernsey. Uptime: . Sadly, all was lost. Uptime was 1018 days, achieved between 18th September 2007 and 1st July 2010. It's a public, general purpose network. This page itself does not serve much purpose, but this server contains many directories containing files that are not controlled by me. If you have any problem, legal or otherwise with the contents of this server, please contact me at luke@bratch.co.uk. 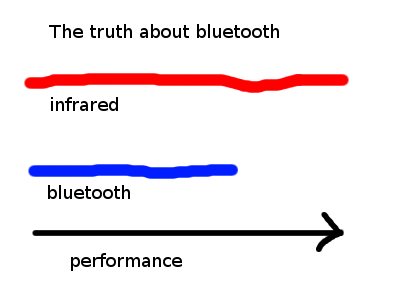 There is reason to believe that infrared is faster than bluetooth. Lanboat | Matt's Rant | Irncola | For Feudonia! The quick brown fox jumps over the lazy clog. "Should have got an FX-55."